Welcome back, Krista! Ten years have passed since you were interviewed here as Lucubro under my banner of Abandon All Hope. Where does the time go? The time certainly has flown by quickly! Thanks for interviewing me again! The members of Second Grave have had a colourful musical past. But what brought you together? How do you think this band stands apart from those previous incarnations? After Obsidian Halo broke up, I had pretty much decided that I needed a break. A couple of years passed and I had the opportunity to play with another band in the area here, but that didn’t end up panning out. So I thought that might be it for me. I went back to school and out of the blue got a random email from Chuck Ferreira (drummer) asking if I’d be interested in starting something heavy. It sounded interesting, but I put it on the backburner for a while. But after a couple of months, took him up on his offer. He had a bass player he had been playing with and I brought down Chris Drzal (Obsidian Halo) as the other guitar player. It was slow going at first, but there was a good vibe. The original bass player didn’t end up working out, and eventually Dave Gein (Black Pyramid) joined the band – which helped us really pick up the pace. Every project I’ve been in has had it’s own thing, but with Second Grave, it just feels like it is the right fit. We all get along really well, and it is really inspiring playing with all of these guys. The name is based upon a thought provoking quotation of Confucius. What is the relevance? 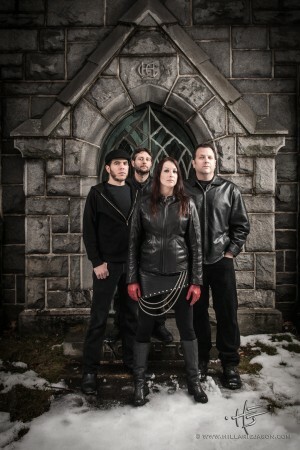 Is the band inspired by the darker side of human psychology? We were struggling trying to come up with a name. We had a board with a ton of names on it, but we couldn’t get everyone to agree. Chris and I were watching a movie one night – can’t remember which one – but the Confuscious saying appeared on screen, and we thought it was really cool. It was dark sounding, but had a thought-provoking feel. Originally the name suggestion was Two Graves, but a quick internet search revealed there were already a few bands with the name. So Chris then suggested calling it Second Grave. When we brought it to the other two guys, they agreed it was cool and hence – Second Grave became the name. In terms of inspiration, I would say yes. A lot of the lyrics I write have to do with human nature – and the darker side of it. Your inspiring debut EP was the definitive highlight of 2012, easily eclipsing many bigger budget albums, yet yours was independent to the bone. Would you share how you managed to shape such a rounded first step together? Did it represent everything written to that point? And was it deliberately given that sense of vinyl flow with two sides? Once Gein had joined the band, we started writing a lot more. We had a couple of songs we had been working on before he joined, but ended up scrapping them. Covet was the first song that we had written that didn’t get scrapped. From there we just found ourselves crafting the Second Grave sound. Once we had the 4 main tracks we entered the studio in May of 2012 and 4 sessions later had the EP. Chris wrote the intro piece a couple of weeks before we went into the studio and I wrote the acoustic piece shortly thereafter. It all came together very quickly, and just had this really great flow about it. It was coincidence that it has that vinyl flow. Of the four songs proper, Covet is perhaps the most Confucian dilemma in spirit. Is it integral to human nature to want to possess, as well as have, the same or as much as our neighbour? Definitely! Everyone is guilty of it – myself included. It’s just being aware of it and putting things in perspective. It’s really easy to see others around you – especially friends who appear to have more or are doing more with their lives and compare yourself to them. But everyone is on a different path in life and we truly don’t know what it’s like to be someone else, so it’s easy to have these grand illusions, ignoring the choices and decisions that might have lead up to it. Divide and Conquer could essentially be Covet on a national, global or galactic scale. Ultimately, does power corrupt? And can you envisage a planet where one tribe does not want to dominate its neighbour to its own ends? Oh yes, power does corrupt. I think some people have good intentions, but they get weighed down with other things. Unfortunately, I can’t see us as a race not wanting to dominate. There are too many looking out for their own interests than caring for the rest of the world. We will always have war. We will always want to control things. It can be quite depressing if you dwell on it. Our old friend Lovecraft is obviously an inspiration! What is it about the claustrophobic atmosphere of his imagination and prose that resonates with you? Mountains of Madness’s title was definitely influenced by Lovecraft, but it actually has nothing to do with the story. I had written the lyrics to Mountains of Madness before Second Grave was even a thought. At the time I had written it, China had just had some horrific mudslides – wiping out entire villages. I was so taken aback that an entire place could be destroyed – people, animals – everything, that I wrote that song. It is from the perspective of one person who has survived – but everything they know, everyone they know, is gone. I think everybody can relate to the anguish of Soul Extinction. But was it written with a particular moment of your life in mind? Sometimes stories present themselves – something that happens to me, or someone I know, or something I read about in the paper, and I get inspired to write. A lot of this stuff I have to write to make me not be so doom and gloom, otherwise if I let it ruminate it can bring me down. Soul Extinction is about someone who is on the verge of death, but instead of being scared by it and trying to fight it, they accept that this is the end – they are making their peace with it. Even though there is that anguish, it is uplifting in a twisted sort of way because you aren’t carrying that burden anymore – you are free. So I wouldn’t say it is an actual current moment of my life, but definitely something I was inspired by while contemplating things. The red door of the artwork references the short instrumental that opens the EP. What is the significance? The heart? Greed? Blood? Blood. Blood that has been spilled. The choices that we make in this life are not always good ones. Sometimes we make them thinking that it is the right thing – especially for the greater good – choosing not to dwell on what those decisions will mean to others. “Through the red door” is about that choice. You are choosing to enter, and go down that path. What is your favourite aspect of the EP? Why? The flow. We wrote all of those songs back to back and listened to as a whole, it really takes the listener on a journey. Approximately how many copies have been pressed and sold to date? Would you welcome a vinyl version or is the preference to focus on new material? As this was a self-released effort, we didn’t have a lot of money after recording. We initially only pressed 100 CDs. Then we sold out of those rather quickly, and pressed another 100. Only to run out of those and press another 100. We at that point decided it was worth it to revamp the packaging and press a further 1000. We would certainly welcome the opportunity to have the first EP pressed on vinyl. As you stated earlier – it has that perfect A/B feeling already to it. We are still very proud of that effort. 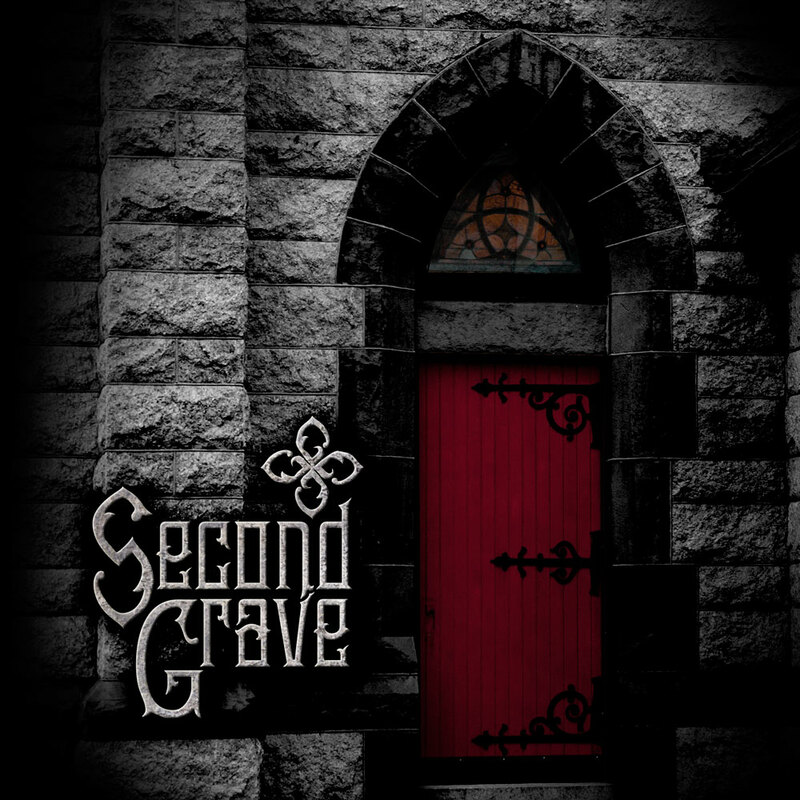 Speaking of newer material, your second offering was a shorter EP in the form of two relatively lengthy songs in signature Second Grave style! But many bands often move straight to record lengthy albums before they have even found their feet. Was the timing right for another concise strike there and then or would you have rather waited until you had more material? I think the 2-song 10” record was the best step for us at the time. Originally conceived as a 12” split, the 10” was offered when the split didn’t work out. We had already recorded the two songs (lengthy yes) and were happy to deliver some new material. Reading the reviews, it’s been an affirmation that people are looking forward to a full-length, and I think we are now ready to deliver that. There appears to be a recurring theme of two to the EP. It was initially slated to be called Gemini and then changed to Antithesis. Would you care to elaborate on the concept and slight shift? 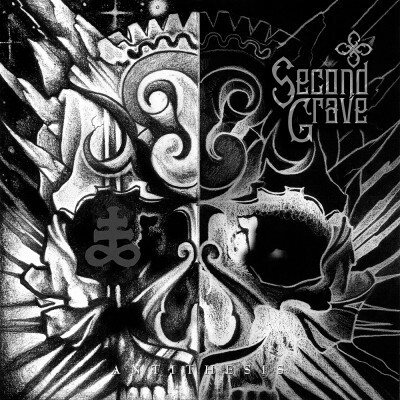 Our name “Second Grave” involves two, it was our second effort, we were recording two songs for the EP, and both songs were about war, albeit two completely different takes. We originally had been thinking Gemini, but after contemplating it a bit longer, the songs aren’t really twins – they are the opposites of each other – literally the antithesis of each other. How does the artwork bind this concept? It certainly looks striking! We reached out to our long-time friend Cory Heisson who is a fine-artist/tattoo artist for the artwork. I told him the name of the album and the concept behind the two, gave him the lyrics and said I was envisioning a face with two different sides – to represent the two sides of the songs. He then delivered that amazing illustration. The EP has been pressed on vinyl and released digitally for maximum spread. In your experience, is the demand for both formats comparable? What feedback have you had this far? I think in this day and age you need to offer the recordings in as many formats as possible. There is no one “true” form. Some people love the warmth of having a physical record, others like the portability of having a digital file to load onto their mp3 player. The benefit of the digital is that you can instantly listen (and hopefully purchase) the vinyl. We have had interesting feedback. Some people at shows are honest in saying they don’t own a record player and want either a CD or a digital version. Others don’t really want a digital version, they prefer a CD format. It’s a mixed bag really. You lined up a local launch show in January 2014 to celebrate the birth of physical version. Would you describe how the evening panned out? Was it typical in terms of attendance and atmosphere? We did. 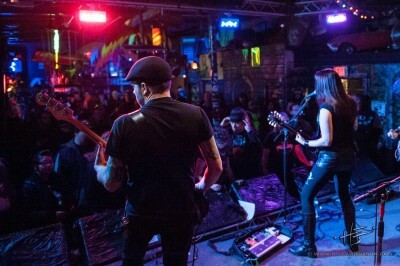 We had asked other local bands to be a part of the night – Gozu and Summoner (Boston) and Set (Worcester.) The show was really well attended, a lot of friends and fans, old and new, came out to show support. Mike Hubbard (WarHorse dummer) is now playing with Gozu, so it was great to be back on a bill with him. It was a really supportive night with some really great music. We had the opportunity to put the bill together, and we tried to find bands that not only fit, but that we also loved and wanted to see play. Second Grave seems to be fairly active on the live front. Over the past couple of years, what have been your best and worst experiences? In terms of best experiences, both release parties we’ve had have been great. Really good crowds and really positive atmospheres. Worst gig, probably playing at Dusk in Providence, Rhode Island. The place itself was really cool, and everyone there was cool, but we had some technical difficulties which ended up affecting our performance. It probably wasn’t as bad as it seemed, but to us we hold ourselves to a high standard and not feeling like we deliver 110% can be a set back. But we certainly learned from that night what the plan should be if it happens again! How important is a festival like Stoner Hands of Doom for exposure and to reinforce a sense of community within the music scene? If you have attended previously, how did it compare to actually playing in November 2013? I think the festivals play an important part. In all of my previous efforts we hadn’t been a part of any, so it is truly an honor to be recognized and added to a bill. Traveling outside of your area – and meeting and playing with so many other talented artists is truly a great experience. We are super excited that the Eye of the Stoned Goat festival will be in Massachusetts this year. We are hoping to show everyone what a great community we have up here! Our bass player Gein had played the same festival with Black Pyramid and has always raved about it and the folks who put it on. Please describe the latest new song Death March! How does it compare musically and thematically to your back catalogue? Ah Death March! Well, it’s definitely in that doom genre and it’s another long one – currently clocking in around 11 minutes. We started experimenting with different tunings – we’re typically in D standard, but went for a dropped C tuning, so the song is a little heavier and more plodding. The chorus is in the “Covet” vein. We also aren’t afraid to experiment and the entire 2-minute intro section has a cleaner, trippy feel that gradually builds, stops to breathe, and then kicks in super heavy. Chemistry is key to a strong band. Unfortunately, your bassist will be moving on soon so how do you plan to fill the breach? Yeah, we knew when Gein joined the band that he and his wife would eventually be moving to California. We just figured it wouldn’t be for a while longer. But we’ve had the opportunity to write some really great songs with him and put out 2 really great efforts. He has definitely become more than just our bass player, he’s become a dear friend and will be missed greatly. But he is still very supportive of us and wants to see bigger and better things happen for the band. We have spoken to a few potential bass players and will be starting “try-outs” in a few weeks. We are hoping it doesn’t take too long as we would like to keep the momentum going. Gein won’t be leaving until May after our gig at the Eye of the Stoned Goat festival, so we are continuing working on new material with him until his departure. Chemistry is big for sure, and whoever steps in to take over from Gein has some big shoes to fill. Where will the band go next? Any longer term plans or ambitions? We are working on new material and hope to release our first full-length later this year. We are all still feeling very inspired and happy to be a part of this band. 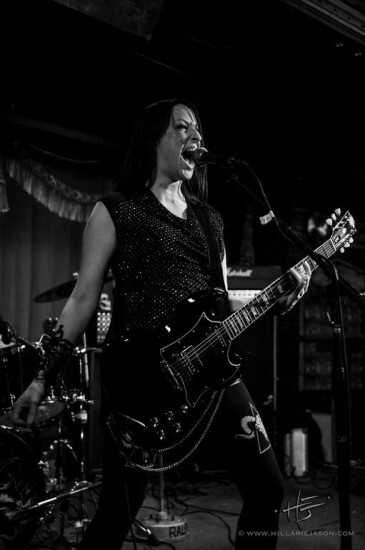 Given that there appears to have been an increasing number of women fronting Heavy Metal bands in recent years, do you think that it’s significant? Might that popularity work for against you? I think it’s awesome – but there have always been woman playing heavy music. It just seems like there are more today. I LOVE seeing women playing music, as a young teenager I was definitely inspired by women who played guitar. I don’t think it’s a novelty thing – it’s just that you don’t see it as often as you should, so we get lumped into this female-fronted category. Whatever the cynics say, you have been singing and playing lead guitar since at least the late ’90s with Warhorse, Lucubro and Obsidian Halo. For what it’s worth, I genuinely believe Second Grave is the best of the lot and could go far! Thanks Danny. I have been doing this for awhile. As time goes on you progress as a player and a writer and you find others to work with who inspire you. 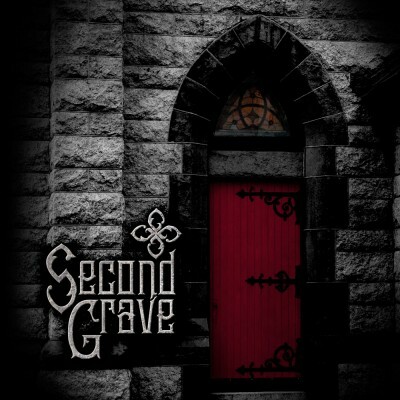 I’m truly enjoying being a part of Second Grave making the type of music that we do, and I hope others enjoy it as well!